Color: Black, Flavor: Black Licorice – I’ve noticed that they’ve taken the black licorice flavor out of a lot of the modern bags of jelly beans. In fact, of the six bags I’ve reviewed so far for this series, this is the first time I’ve found the flavor. As a kid, the black licorice jelly beans would tend to be ignored by everyone – except me. 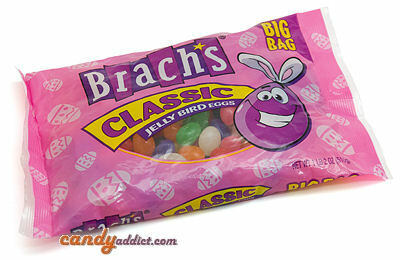 So I’m delighted to report that black licorice jelly beans still exist and you can find them here in the Brach’s mix. Actually, I found out that Brach’s makes whole bags of just the black licorice flavor – great news for those of us who are black licorice addicts. Expect a really strong black licorice flavor from these jelly beans – yum! Color: Red, Flavor: Cherry – Did you ever have to take liquid cherry penicillin as a kid? I’m so sorry to tell you that’s what this cherry jelly bean flavor reminded me of. It’s not bitter like the penicillin, but something about the artificial cherry taste sent me right to icky medicine flashbacks. But if you never endured childhood cherry penicillin, the artificial cherry taste should be trauma-free for you. Color: Yellow, Flavor: Lemon – There’s something a bit wonky with the lemon flavor in this jelly bean. Even with all the sugar, there seemed to be a hint of bitterness to it. Still, if super sugary lemon brightens you day, this is the jelly bean for you. Color: Pink, Flavor: Strawberry? – Ok, I think the pink jelly beans are supposed to be strawberry but then again maybe they’re cotton candy. The flavor I got was sweet with some kind of faint fruit flavor, so I’m leaning toward strawberry as the flavor. But basically, the sweetness overwhelmed the flavor in the pinks. Color: Purple, Flavor: Grape – The grape flavor reminded me of grape Kool Aid! Eating the grape jelly beans actually made me smile – it had me harkening back to being a kid in the summer, drinking grape Kool Aid, and eating those sugary grape Popsicles. Needless to say, I really enjoyed these! Color: Green, Flavor: Lime – Like the lemon, the lime jelly beans have a wee hint of bitterness to them. However, I liked the lime a lot more than the lemon. The flavor had a better balance with the sweetness. Color: White, Flavor: Pineapple? Coconut? – I’m guessing again, but I think the white flavor is supposed to be pineapple. I remember debating this with my siblings when we were kids and we never really reached a consensus. The white color made me think that maybe it was coconut but there’s a weird tang that makes me think this is supposed to be pineapple. In any event, this is the most unusual flavor in the bag. Color: Orange, Flavor: Orange – As super sugary orange flavors go, this is pretty good. It didn’t taste as artificial as some of the other flavors and I was surprised at how much I enjoyed it. So, basically if you want to feed your sugar jones, you might want to check out these jelly beans, er, “jelly bird eggs.” As a bonus, the classic flavors might take you on a nice, nostalgic trip down memory lane. HaHa I bought some of these this weekend! I think the pink (my favorite) tastes like cotton candy and the white is definately pineapple. @ Kathy – Thanks for the input on the flavor. The pink, in particular, had me scratching my head! if it’s white but it tastes like pineapple, it’s probably pina colada.